Touring Australia: Gluepot to Quorn. Our car and Caravan at our camp site at Gluepot. Water covers the road from Gluepot. Dark storm clouds are the signs that there is still more rain to come. The old crane winch at Mt Bryant that was used to unload rail freight in the days when the original Ghan ran through this settlement. The ruins of an old hotel stands on it own as a sentinal of the past when the Old Ghan Rail Line passed this way. 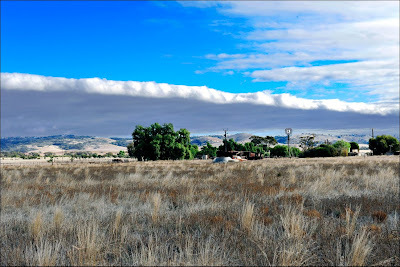 A layer of cloud reminded me of a section of floating ice shelf in Antarctica. The electrical storm from the previous night had proved to be the start of the bad weather that was about to hit South Australia. Tuesday morning was dark and overcast and the rain from the previous night had left pools of water covering much of the camping area. We decided to set up at the nearest bird hide to see if any birds turned up for the water. Sadly for us the abundance of fresh water had removed the need for birds to go to the water points to drink and no birds arrive. The rain continued occasionally allowing the sun to glow through the cloud cover for a few minutes at a time between the showers. Back at the camp site we heard birds at a pool of water beside the caravan and a family of Chestnut Crowned Babblers were bathing and drinking at the pool. I managed a few photos and these were the only bird shots that I would get for this trip into Gluepot. Not having any communications with the outside world, we were unable to get a forecast for the weather. We debated whether to stay or go and by lunch time we had made the decision to go. Driving out the 50 kilometres of unsealed road, we had to continually drive through long pools of water. Lucky for us, the road was sand based so we were not in any danger of getting bogged, even with the caravan behind. We noticed the tyre tracks of at least four other vehicles on the track in front of us. Back on the sealed tar road we headed for the old Murray River port town of Morgan and then to Burra. 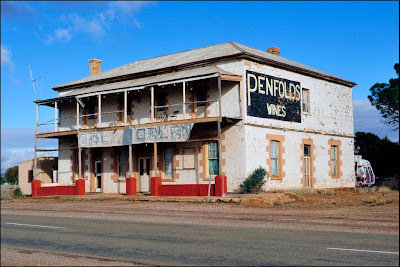 Burra was one of the towns on the Old Ghan railway line. Our route from here was to take the road that followed sections of the old line. Night was closing in fast with the bad weather, so we made camp 16 kilometres further down the road from Burra at a Mt Bryant, another station stop on the Old Ghan line. Light rain continued through the night and the morning sky still maintained the angry storm clouds. Driving north we started to see clear sky and then a strange cloud form that looked like a section of the ice shelf in Antarctica floating in the sky. 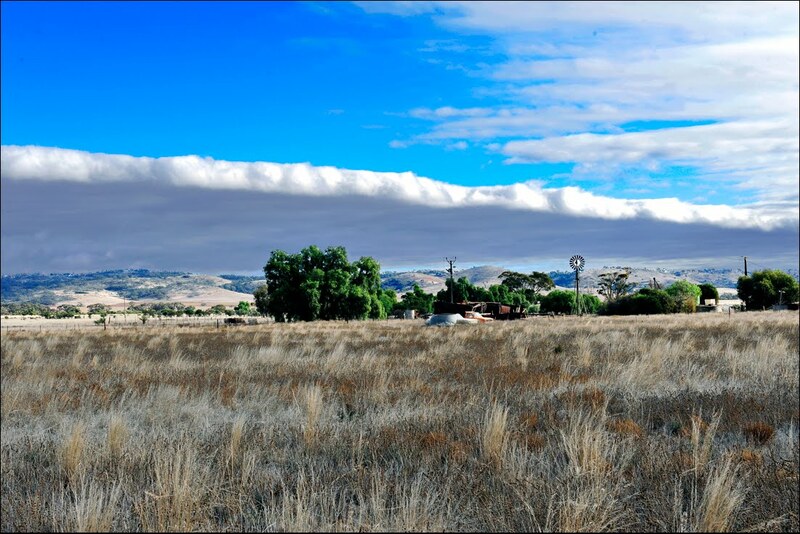 The edge of the cloud was like a vertical white wall. Also along the road, the ruins from old buildings and homes were scatted through the paddocks. The new eyesore on the horizon was dozens of large wind generators along the ridgeline between Burra and Jamestown. A new set of transmission towers carry this supply over to the gulf. Our arrival in Quorn before lunch was the end of our trip for today. We booked into the Quorn Caravan Park where I had stayed before. The storm clouds and conditions had caught up with us again and the afternoon was spent exploring the small town and relaxing. Conditions were very poor for photography. Gluepot is certainly a different place to be visiting when it rains...I was so looking forward to more images and stories from this birdwatching jewel. It seems like you made the right decision and left before you got stuck. As dissapointing as it must be to you,be satisfied that you gave it your best shot. I hope that there are many more memorable events still ahead of you on your great touring adventure. As always, looking forward to reading and viewing all that you post.